The evidence is clear that vaccines play a very positive role in disease prevention at every stage of life. This is why it is important to see your doctor regularly and to stay current with immunizations that can help you avoid serious illnesses. 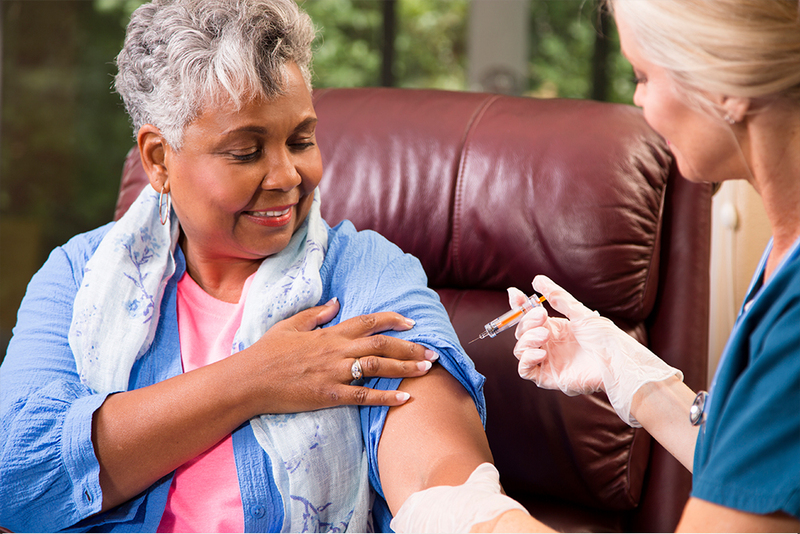 A vaccine that is relatively new is the first vaccine for adult shingles. Zostavax was approved in 2006 by the FDA, and is advised for adults between sixty and eighty years of age. Shingles, which comes from the varicella-zoster (chickenpox) virus, causes neuropathic tingling and burning pain on the skin, accompanied by a rash with blisters. The rash typically goes away in a couple of weeks; however, for about one in seven people, severe pain continues after the rash is gone. This pain is called post herpetic neuralgia and it can last for weeks or months. Severe cases leave people suffering with constant neuropathic pain for years. In the very worst cases, shingles infections can lead to blindness, pneumonia, and hearing loss, but these instances are less common. How effective is this new vaccine? Zostavax is not a hundred percent effective. In the age group tested, the vaccine prevented shingles in about half of the people. Most vaccinated individuals who eventually developed shingles experienced milder symptoms, so the vaccine did give them a benefit even though it did not completely protect them. If I had chickenpox as a child, don’t I have immunity for shingles? No, having had chickenpox does not convey protection for adult shingles. Once the chickenpox virus is in your system, its DNA lies dormant in your nerves. Shingles occurs when one of those affected nerves becomes infected with the dormant chickenpox virus. So, whether or not you had chickenpox as a child, Zostavax is recommended for adults over sixty and younger than eighty. Why not get the shingles vaccination before age sixty? The chance of developing shingles is significantly lower in adults who are in their forties and fifties. But the risk rises for people over the age of sixty. For that reason, both the Centers for Disease Control and Prevention and the Advisory Committee on Immunization Practices have officially recommended that the shingles vaccination be routine for Americans sixty and older. These recommendations mean that health insurance companies are more likely to cover shingles vaccinations for this age group. However, you should check with your insurance carrier ahead of time to determine if you are covered. At this time, Medicare Part B does not pay for it. A person with shingles can pass the virus on to someone who has never had chickenpox; however, that person will develop chickenpox, not shingles. A person with shingles cannot pass shingles on to someone else. If your immune system is significantly weakened from chemotherapy, radiation, or HIV/AIDS, you should not get the vaccine. However, if your immune system is only mildly suppressed (from steroid treatment for chronic illness, for example), you should talk to your doctor about being vaccinated because with a slightly suppressed immune system, you may be at higher risk for shingles. Are there other adult vaccines I should discuss with my doctor? You should talk with your doctor about three vaccinations, in addition to the annual flu shot. The first is the vaccine for pneumonia, which is recommended for people over age sixty-five. The second is a new tetanus vaccine that contains adult pertussis (the TDaP vaccine), providing additional protection for whooping cough. The recommendation is to substitute the TDaP one time for the standard tetanus shot you should be receiving every ten years. The third vaccination is for hepatitis B. This is recommended for people who are sexually active with more than one partner or who use IV drugs and share needles. It is also recommended for health care providers, police, medics, and people in other occupations that place them at a higher than normal risk for needle sticks and exposure to blood. Your doctor may also recommend this vaccine if you are traveling abroad. Dr. Mead is board certified in internal medicine. He is a member of the medical staff at Cayuga Medical Center and in practice with Cayuga Medical Associates, where he can be reached at 277-2170.